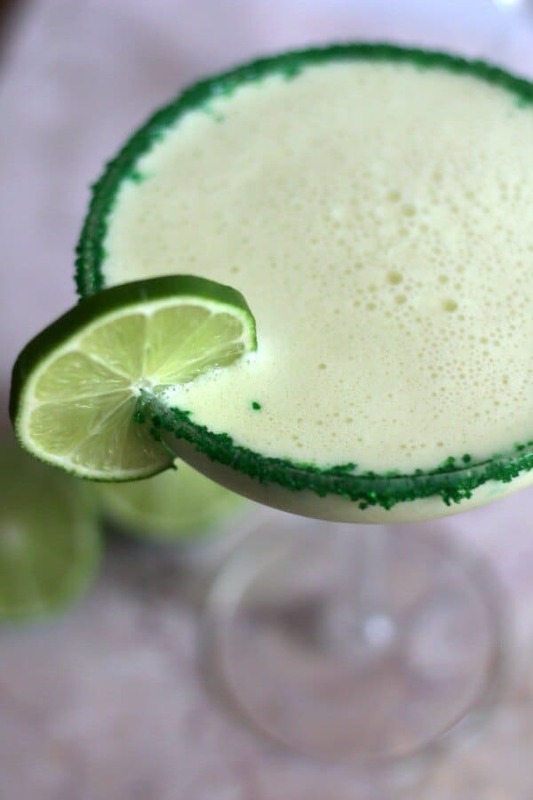 If you are looking for a special cocktail this Key Lime Pie Margarita might just be it. It’s creamy, tangy, and sweet just like your favorite Key Lime pie but it definitely has that margarita kick to it! Perfect for Cinco de Mayo or any of your summer parties! I will be the first to admit that I don’t really love regular margaritas — I want mine sweet, slushy, and as large as possible so that I don’t have to get up from my chair to refill it very often. This margarita is sweet, creamy/slushy, and you can make it as big as you want. It is SO good with tangy lime, creamy vanilla, and a touch of coconut flavor that it’s almost a dessert. I was making them this morning and trying to get it exactly right for the pictures. At my house the BEST time for me to take pictures is between 9 am and 11 am so you can see the problem, right? I am finishing this post and heading to the gym so the yummy margarita I made is staring at me from across the table as I write. There’s no way I’m getting through shoulder day after drinking a margarita so it will have to wait until later. So tempting. I mean, it’s practically a lime version of an Orange Julius, right? Breakfast smoothie? No? In November I was at my stepdaughter’s birthday party with my husband. The party was hosted by my husband’s ex-wife and his ex-sister-in-law. It’s really kind of crazy but he and his ex have managed to remain friends through it all. Sometimes it makes me super uncomfortable but she is very sweet and includes me in everything. I always have mixed feelings because on the one hand I like her a lot but on the other…. my husband’s ex-wife. I mean… you know… she’s been there before. Kinda weirds me out. So I did. They were the plain, lime kind with ice but not slushy. They didn’t seem TOO strong. Only they kept ordering them for me… I tested my heels once or twice and I thought I was ok. When I got up to leave I felt the margaritas hit me but I felt pretty stable. I did knock my chair and a glass of water over BUT that was my lack of grace more than my having too much to drink. I walked (on heels, mind you) out to the car and got in — still felt kind of light-headed but pretty much ok. In fact I felt pretty much ok until I got home, went to the bathroom, threw up everywhere, and then passed out in the bed. Sigh. Margaritas. SO when you drink margaritas stick to the girly, slushy, sweet ones because you start feeling full before you’ve had THAT many… at least in my experience. I have used a lot of different ingredients, and many times I do choose the generic or lesser known brand. When it comes to sweetened condensed milk, though, it’s Eagle Brand all the way. They have NOT paid me… I just am very loyal to the product. Also, be sure to use KEY LIME juice not just lime juice. It really does make a difference! Finally, I love my ceramic knives for cutting things quickly and evenly, like the lime slices for this drink. These are on sale and a really good deal. Just in time for Cinco de Mayo and all of your summer barbecues I present to you – The Key Lime Pie Margarita! Creamy, tangy, and sweet this slushy margarita tastes like your favorite key lime pie! This makes 2 small margaritas or 1 grande! 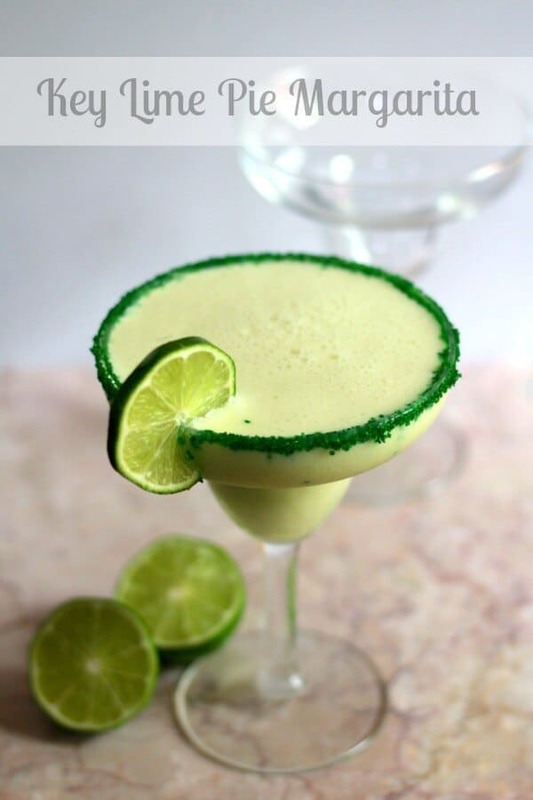 Mix the tequila, sweetened condensed milk, Midori, key lime juice, coconut rum, vanilla vodka, confectioner’s sugar, and about 6 ice cubes in the blender. Meanwhile dip your fingers into some of the sweetened condensed milk and run it around the tops of the glasses. Roll the rims in green sugar crystals or graham cracker crumbs. Pour the Key Lime Pie margarita in the glasses and garnish with the sliced lime. Have you ever made this in a large batch and kept in the fridge for the next day? nope. I usually drink it all LOL! I love key lime pie! What a great flavor for a drink! I’m SO saving this recipe for later. Our lime tree will have fruit soon – can’t wait to try this with fresh limes! Sounds so good! Love your spin on a margarita! It’s sweet that y’all can get along. Margaritas like this one make any situation better! How fun! I don’t think I’ve ever had a dessert cocktail, that needs to change! you gotta love a dessert and cocktail all in one! How fun is this drink!? Dessert and drunks all in one!